Bad news, Cleveland Browns fans. The quarterback many thought could be the next (attempted) savior for this moribund franchise is officially off the market. 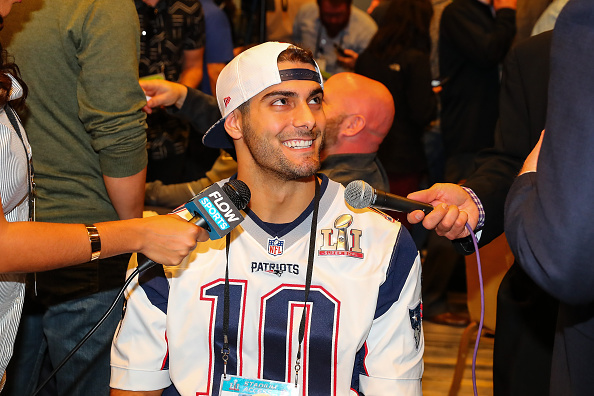 Over the past few weeks, various reporters have heard rumblings claiming that, contrary to popular belief, the New England Patriots wouldn’t be open to trading backup Jimmy Garoppolo. Despite numerous early rumors claiming the Pats would be willing to part with Tom Brady‘s understudy, the tide appeared to be turning. Today, ESPN’s Adam Schefter seemed to make it all official, claiming New England had made Garoppolo unavailable. So, a player many thought would be a perfect fit for Cleveland is no longer on the table. The Browns now have to look at other ways to fix their QB woes. Garoppolo is not an option. At least, this is what we’re being told. Whether or not it’s actually true is a different story. Personally, I don’t buy the idea the Pats have now made Garoppolo untouchable. In fact, it sure seems like they’re using this as an attempt to bait an eager team into sweetening the pot in a potential trade. First of all, what is it that makes Garoppolo suddenly unavailable? He’s still on the final year of his contract. Brady still intends to play into his 40’s. Barring any unforeseen circumstances, Brady will still be New England’s quarterback heading into 2018 and the team will have to decide how to handle Garoppolo’s impending free agency. This was the case three or four weeks ago when the Pats backup was reportedly available for a trade. Nothing about this has changed as of today. This is part of the reason I believe this is a ploy. When you analyze other elements of this report, it only piles up more evidence. Lombardi is seen by many around the league as coach Bill Belichick’s mouthpiece since he’s spent a lot of time within the New England organization. He’s previously been accused of conveying Belichick’s opinion through the media, such as when he ripped Browns linebacker Jamie Collins after New England traded him. So, is Lombardi actually telling us why New England isn’t moving Garoppolo, or is he carrying the water for Belichick, increasing the value for the player by hammering down just how talented he is? Consider also the fact this news is coming out right before the combine. How does that make the report tough to believe? Glad you asked. Let’s say the Browns evaluate the top QB prospects at the combine and don’t see anything it likes. Suddenly panic sets in. They know they need a quarterback. None of these incoming rookies blow them away. The latest reports claim Tyrod Taylor is likely staying with the Buffalo Bills. The free agent market is weak at best. If this desperation results in the Browns calling New England and seeing if the No.1 overall pick is enough to make Garoppolo available again, it’s tough to believe they get rejected. This is why I think this latest development isn’t set in stone. A lot can change in the coming days, but it’s very difficult for me to believe the Patriots are speaking the truth when they say Garoppolo is off the books. Or maybe they really mean it. Maybe they know Garoppolo is too talented, that Brady’s desire to play through his 40’s is respectable, but not entirely realistic. Maybe the Pats just want to keep him around and franchise him next year. Heck, Schefter has since backed up his report, literally saying “Jimmy Garoppolo is not going to be traded.” Maybe I’m just having trouble accepting the truth. If I were a betting man, though, I’d still put money on Garoppolo still being available for the right price. The Pats saying otherwise is just trying to drive said price up even higher.